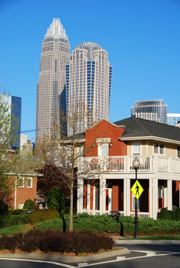 Uptown Charlotte, NC – From the typical condos and townhouses to the high rise towering condo skyscapers, “Uptown Charlotte” is alive with new homes and night life. Most towns call their center cities downtown, but Charlotte is a new kind of town and we call it “Uptown”. Zip code: 28202. The residential areas are within the center of the Interstate Route #277 loop that acts as a beltway around the core area of town where financial giants, Wachovia and Bank of America, have their national headquarters within walking distance. It’s all about living, shopping, and working close by.